Throughout our world's oceans live wild animals that swim, leap, and dive through the pages of this charming title. 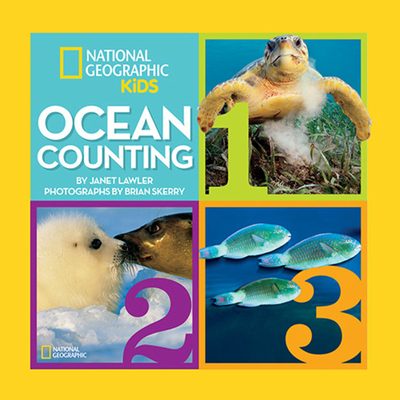 The photography in this book presents young readers with a foundation for learning basic counting skills while discovering some magnificent ocean animals. The marine life captured on each page portray familiar favorites along with a few lesser-known, but still amazing, animals. Lyrical text about each creature is both lively and thought-provoking. "Did You Know" facts accompany each spread to add both fun and fascinating tidbits about each creature. Fact boxes in the back of the book include information about the animals' homes, sizes, diets, predators, and babies. The book ends with an interactive map and a brief and inspirational note from National Geographic photographer Brian Skerry. A glossary helps kids expand their vocabulary, and a list of books and websites for further reading help jump-start more discovery. BRIAN SKERRY is an award winning photojournalist who specializes in marine wildlife and their underwater environments. Since he began shooting for National Geographic in 1998 he has covered an extensive range of subjects and stories. JANET LAWLER is a children's book author from Connecticut. Her previous titles include: If Kisses Were Colors, A Father's Song, A Mother's Song, Tyrannoclaus, and A Mama Bug's Love.